This stunning, feature-filled cordless kettle boils rapidly without limescale. If you’re looking for a kettle in the UK you simply can’t ignore the many charms of the Dualit Lite Jug. It’s an award-winning cordless electric kettle that ought to be on everyone’s wish list. So much has gone into the small details of this brilliant kettle it’s hard to know where to start in extolling its virtues. The high-quality stainless steel Dualit Lite Jug comes in an array of delightful colours from Blue Sky, Pistachio Green, Pink Rose, to Black and many others. 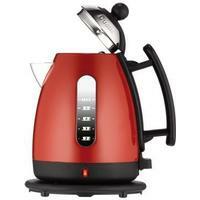 It’s an upright kettle with a smooth pouring action and clever, contoured drip-free spout. The handle is insulated against the heat, there’s a useful finger guard, and a heatproof knob for opening the hinged lid. The body is lightweight but durable so easy to lift, fill and pour – even when full to its 1.5 kg capacity. On the outside of the kettle you have a handy viewing window with accurate cup level indicators. The cordless Lite Jug has a non-slip rubber base with a 360o swivel design. There are some very useful additional features from the removable and washable limescale filter, to the automatic cut-off safety switch if it boils dry. In terms of performance this kettle heats so quickly you can make four cups in barely 150 seconds. It’s also possible to fill the kettle for exactly one cup and it will boil it perfectly without a trace of limescale. And on the subject of limescale, the element is concealed and therefore won’t get damaged by any hard water deposits - meaning the Dualit Lite Jug should stay with you for years. Finally, its narrow opening makes cleaning a little tricky, and while by no means being the loudest kettle in the world, it’s not exactly the quietest model either. But these churlish gripes aside, this is one of the best kettles money can buy. Why you should buy it: There simply aren’t better looking or more functional kettles out there. It may not be the cheapest, but the attention to detail in design and functionality is something to behold.